Indoor and outdoor pollution caused by the burning of traditional fuels and diesel are causing the premature deaths of over 10 million people in Asia every year. LPG, as a modern, clean burning fuel, is a cost effective solution to pollution, energy poverty and distributed energy for the Philippines and the industry should be further developed to reach its full potential. In line with this, there will be an upcoming LPG Philippines Forum 2015 on August 24 and 25, 2015 at SMX Aura, Manila, Philippines with delegations of over 200 of the top energy and environmental leaders in the country participating at the LPG Philippines Forum 2015. The Asian LP Gas Summit has been successfully conducted in Manila, Philippines in 2011, and Ho Chi Minh, Vietnam in 2013. There was a hiatus in 2012 as the World LP Gas Forum was conducted in Bali, Indonesia. Another one was held last March 10-12, 2014 at the Manila Hotel. The LPGas Summit was established in 2011 to organize the Asian LP Gas Summit. The event seeks to encourage the growth of the LPG industry and to promote discussion and industry networking for the sustainable growth of the LPG industry with a focus on technology adoption, safety and consumer education. From household consumption to autogas, the event promotes the adoption of LPG as the fuel of choice by providing a quorum for industry stakeholders to meet with policy makers, international technology providers and operators to exchange ideas, share best practices, and shape the growth of the industry. 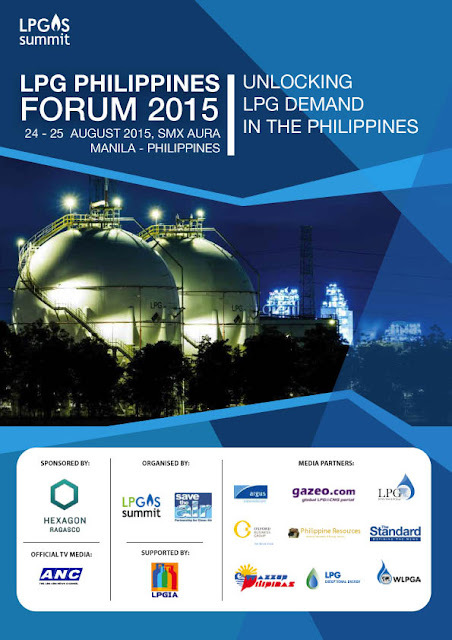 The Asian LPG Summit discusses the challenges facing the LPG industry in the Philippines. As a follow on to that discussion, the LPG Philippines Forum 2015 aims to provide a platform for the industry and government to get together and discuss urgent and important matters pertaining to unlocking LPG demand in the Philippines. The topic of LPG for power generation, autogas and developments in household and reticulated systems are amongst some of the key topics that will be again addressed.